Apple's Beats brand in April announced upgraded wire-free Powerbeats Pro earbuds that are quite similar to Apple's recently released second-generation AirPods, but with a focus on fitness and working out rather than everyday use. Powerbeats Pro is designed for fitness and have a design similar to prior Powerbeats models with earhooks that fit over the ears to secure them in place along with four ear tips in various sizes for a customizable fit. 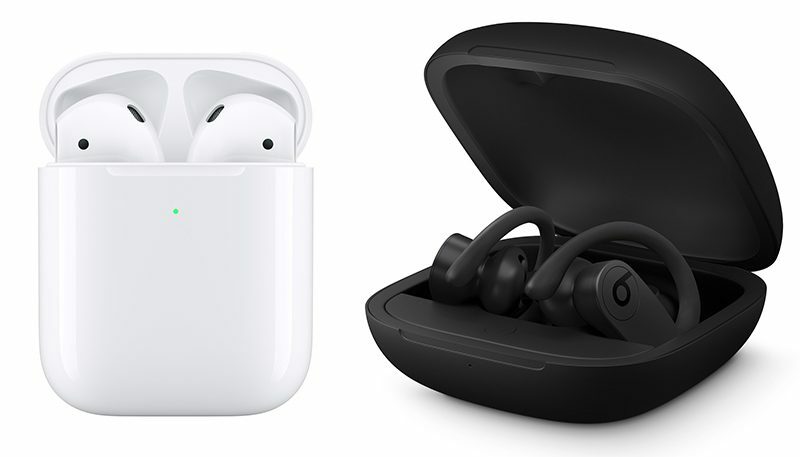 Both the Powerbeats Pro and the AirPods come in charging cases, but while the AirPodscharging case is small, compact, and the size of a dental floss container, the Powerbeats Pro charging case is much larger, clamshell-like, and not as pocketable. Apple says the sound was a focus when designing the Powerbeats Pro, with the new earbuds offering powerful, balanced audio with pure sound reproduction, enhanced clarity, and improved dynamic range. There is no off button on the AirPods and there is no off button on the Powerbeats Pro. The Powerbeats Pro come on when taken out of the charging case and turn off when putting back in, and will also go into a sleep mode after a period of inactivity to preserve battery life. The AirPods work the same way. AirPods only come in white, but Powerbeats Pro comes in Black, Ivory (an off white shade), Navy, and Moss (an olive green). 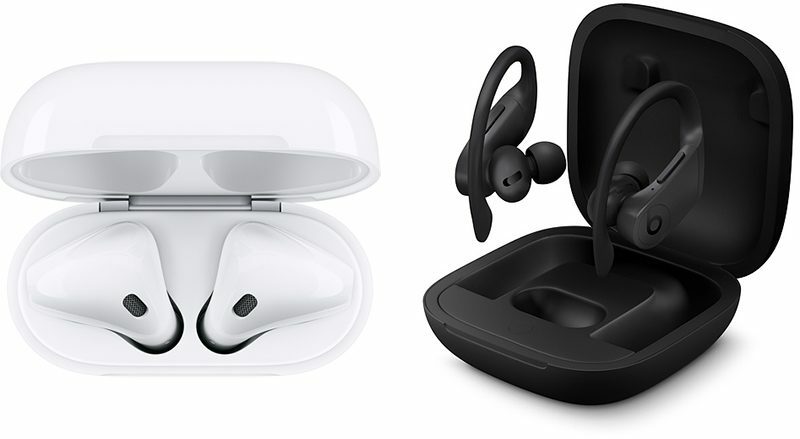 AirPods also feature a white charging case while all Powerbeats Pro models ship with a black charging case. Powerbeats Pro has all of the same sensors and features that are in the AirPods, including ear detection that plays/pauses music appropriately based on position. The Powerbeats Pro actually has two beamforming microphones on each side to make up for the lack of a stem like the AirPods have. Phone calls on both the AirPods and the Powerbeats Pro are designed to sound crisp and clear. Apple's AirPods have a similar fast charging feature but it's not quite as good due to the smaller battery, offering three hours of listening time with a 15-minute charge. 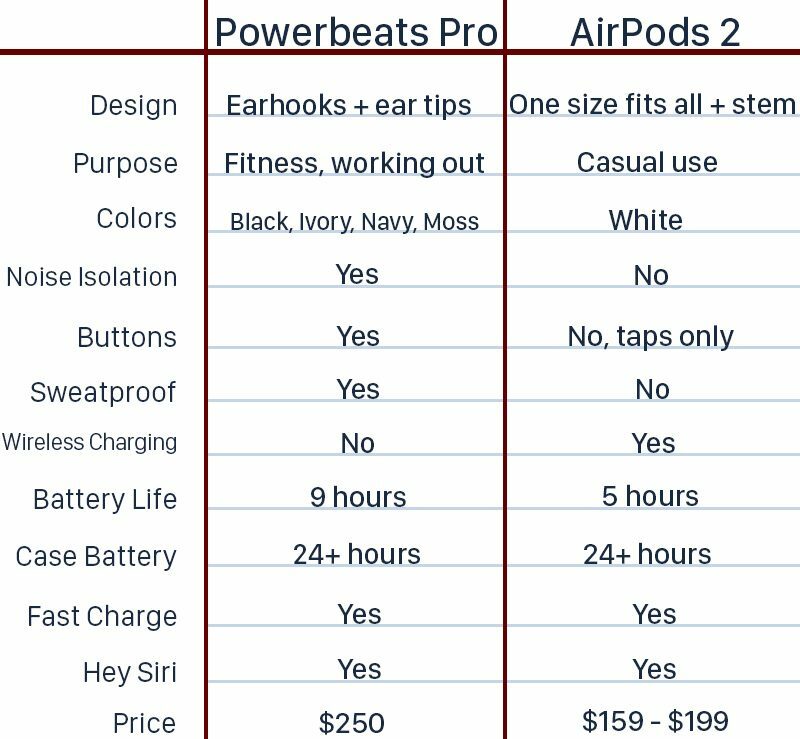 Choosing between AirPods 2 and Powerbeats Pro will depend on how the AirPods fit in your ears - some people can't get a good fit with the one size fits all design -- and your budget. 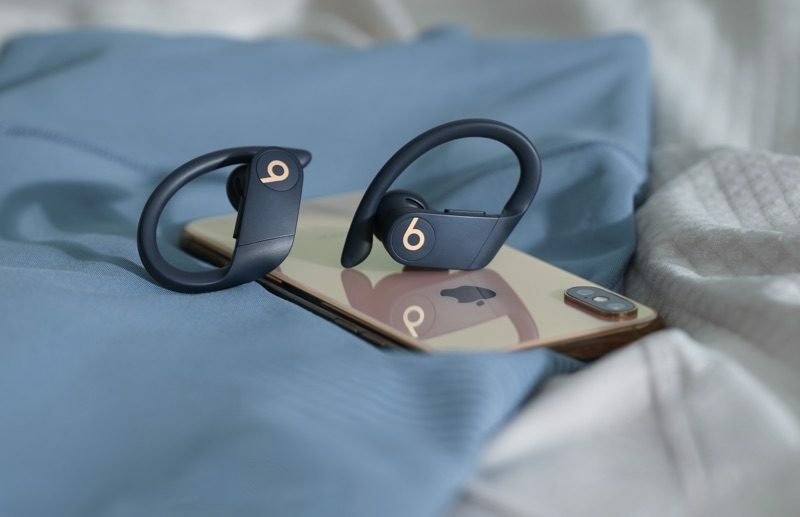 The Powerbeats Pro' hooks and ear tips in multiple sizes will potentially offer a better fit and will certainly be the better option for people who need earbuds for physical activity.